One way to develop or deepen an understanding of botanical art is to compare artworks from different historical periods or by different artists to see how specific plants are portrayed--how realistic is the depiction of the plant, which structures of the plant are emphasized, and what level of detail is shown. 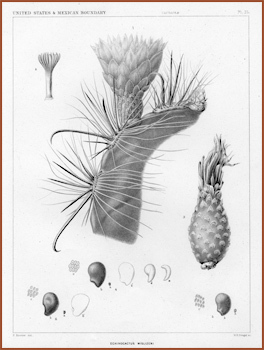 Botanical Art of the Sonoran Desert: Past & Present includes a few instances of portrayals of the same plant by artists from different historical periods. These artworks demonstrate how the purpose for which the artwork was created influences the composition and amount of detail included by the artist. Below are different presentations of three plants: Yucca baccata, Banana yucca; Erythrina flabelliformis, Coral bean; and Ferocactus wislizeni, Fishhook barrel cactus. 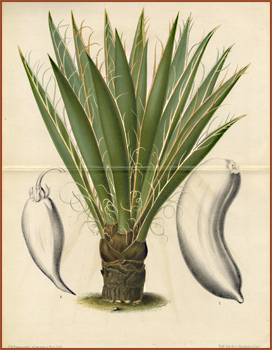 Displayed below are three very different compositions of Yucca baccata in which the plant is rendered in varying degrees of detail. Each gives a different amount of information about the plant, but all present realistic artistic portrayals of the plant. 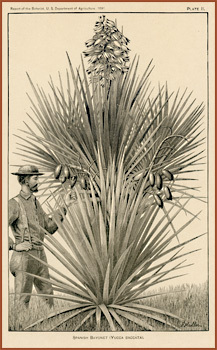 On the left is a colored lithograph of Yucca baccata. The work accurately represents the leaf color with the variation in color on the margins and filaments. The rounded form of the fruit is accurately rendered through changes in values of gray. This illustration does not show the flowers or the size of the plant. Perhaps the structures shown are the ones that the author thought most important in distinguishing this yucca from other yuccas. In the wood engraving in the center, the artist has shown the mature size of the plant by placing a person next to an accurate rendering of its habit, flowers and fruits. The pen and ink composition on the right provides the viewer with much more information about the plant by showing enlargements of the fruits and their attachments, the flowers, and a leaf with filaments on the margins. It also shows a reduced impression of the habit, or growth form, of the plant. 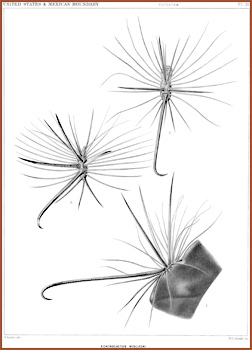 Below are two pen and ink illustrations prepared for scientific botanical publications. 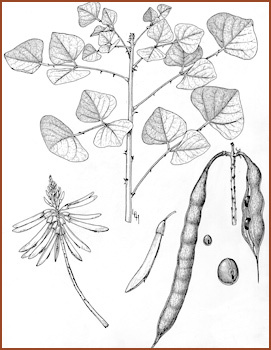 The illustration on the left shows the habit of the plant, the attachment of the seedpods, an enlarged flower and enlarged seed. 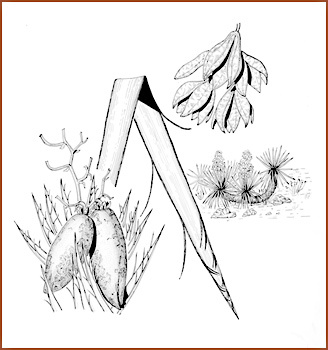 On the right, the artist shows a seedpod opened to reveal the seeds, a branch with leaf attachments, and an inflorescence with both flowers and seedpods. 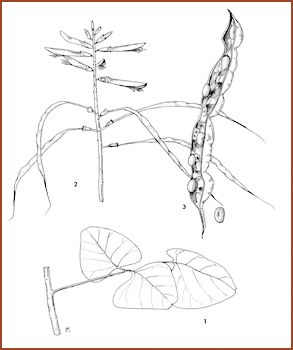 While both illustrations present an accurate picture of the plant, Hamilton's drawing on the left provides more information and thus a more accurate and complete portrayal of the coral bean. Often the publication in which the illustration appears does not have enough space to include a larger illustration with more information. In that instance the artist and botanist/author must be very selective about which structures to include to complement the text. 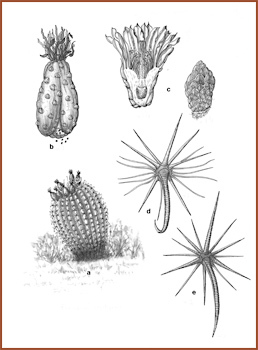 Displayed here are four illustrations of Ferocactus wislizeni. Each is different in the presentation of the plant and the detail of its structures. Three of these illustrations were presented in publications and visually complement the written descriptions in the text. The botanist or author chose what was to be illustrated, and in some illustrations, specific structures are rendered in great detail, while in others, the entire plant is emphasized. 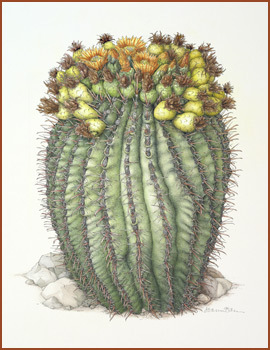 The fourth illustration was selected for the juried exhibit and was not prepared for a botanical publication. It represents solely the artist's desire for a realistic and aesthetically pleasing portrayal of the plant.